Institute's Riverside Stadium after the floods in August. After a few years as number two, the club’s former skipper was appointed the boss after Kevin Deery resigned following a second year promotion playoff heartache. McLaughlin, who I believe no manager in European football has had to overcome what he has had to in his debut season as gaffer, also cut-short his honeymoon because of pre-season. “To be honest I had a crazy few months and I have to admit my wife Helen, has been very understanding and great,” he insisted. “In the space of a few months we suffered promotion playoff disappointment, then when I was on my stag do I found out that Deerso decided to leave, when I came back I spoke to ’Stute chairman Billy Anderson and he offered me the job, I decided to take the job after speaking to both Deerso and more importantly the players, who encouraged me and backed me 100 per cent, which was brilliant. “Then to be honest the real work started because we were in the middle of getting our wedding and honeymoon organised and I have to admit that I told Helen that we had to cut our honeymoon short, because pre-season training was starting, let’s just say I’m a lucky man to have such an understanding wife. Institute boss Paddy McLaughlin will not forget his first managerial job. “Not only did we just cut a few days off the honeymoon, Helen also couldn’t believe that quite a few times I would be on my phone talking and texting Brian Donaghy and Kevin Doherty, but we got through it, just about,” he joked. After returning from his honeymoon the Creggan man hit the ground running as he prepared for his debut season in the hot seat. The Waterside men started with an impressive stoppage time win over Dergview before then playing their first home game of the 2017/18 season at Drumahoe against Lurgan Celtic and although that match won’t live long in the memory, it may be a quiz question in years to come - ‘Who was the last ’Stute player to score at the Riverside Stadium?’ - for the record it was Robbie Hume, as it was the only match staged at Drumahoe, before the August floods rolled into town. “Look after all the stuff from our playoff promotion defeat, to my friend resigning, me being offered the job when on my stag party, to getting married and cutting our honeymoon short had have been a year, then I could maybe have believed it, but for all that to happen in just a few months was crazy,” he added. Not only did we just cut a few days off the honeymoon, Helen also couldn’t believe that quite a few times I would be on my phone talking and texting Brian Donaghy and Kevin Doherty, but we got through it, just about. “Then we start the season well with a great last minute win against Dergview thanks Ryan Morrow’s rocket there really was a great feel good factor within the club, but then we were hit by another massive blow when the ground was flooded. “The first time I saw the ground and the whole YMCA area, I knew then that we wouldn’t play at Drumahoe again this season and to be honest it crossed my mind that we may never be back and that looks to be the case now. Currently sitting three points behind Championship leaders Ballyclare Comrades, McLaughlin isn’t getting carried away with things. “We are in a good position, but that’s it. Wee still have a long way to go,” he insisted. “When I spoke to Bill (Anderson) about the manager’s job I told him that I was aiming for promotion although he told me that the club had a two year strategy plan in regards promotion. I told him that wasn’t my plan and it hasn’t changed. 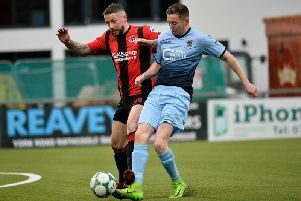 “There are quite a few teams who I know will be up there at the end of the season - obviously Ballyclare, but teams like Newry, Portadown, the Welders, and Larne will all be aiming to get into the top six before the split. That’s when we can all start to properly look at the league table. One thing for sure is that McLaughlin knows the camaraderie and togetherness in the dressing room is second to none. “As I said before I even took the job, I spoke to all the players and told them what my plans were and they have all bought into it, which is great,” he confirmed. “The togetherness in the squad is great, in fact it’s probably the best changing room I have ever had in terms of my playing days or coaching. Everyone gets on with each other and they all back each other up. “Most of the boys have been here these last couple of years and they have developed, even the young boys who have come in this season the likes Caoimhin McCallion and Jake Morrow have been brilliant.